DNA analysis as a part of family history research has been around and available for many years, but I have hesitated in writing about it in the past because I think it can be a diversion from the kind of records research that needs to be done for any individual in order to establish a sound basis for understanding their own genealogy. And, as I've emphasized numerous times in these periodic columns, genealogy involves all of your ancestral lines equally - not just the one line that results in your surname. Even for five generations, this requires pursuing sixteen different ancestral lines - and the number of lines doubles with every generation that you pursue further back in time. The paper trails that you establish in doing this can be fascinating and can occupy many years of research, including correspondence with distant relatives that you never knew existed until you got deep into researching your family history along many lines. It's only after going through this process and establishing a good understanding of the most recent 5 -10 generations of your own ancestry, including where and how they lived, that you may be ready to see if some DNA analysis would be helpful in establishing an understanding of the deeper history of some of the groups of people that may have contributed to your own genetic makeup. There are many common misunderstandings regarding what can and can't be determined regarding your ancestry from comparison of your DNA with that of many other individuals. And the key point is that it does involve statistical probabilities resulting from comparison of your own test results with the existing database of other individuals who have had similar tests on their own DNA. You cannot determine anything from your DNA about any possible relationship with anyone who has not also had a similar DNA analysis. Even more limiting is the fact that the types of DNA analysis that are available for genealogy are limited to a direct male line ancestry, a direct female line ancestry and to an analysis of close relatives. These leave out the great bulk of your ancestry that doesn't fit into these three categories. There are three different types of DNA tests that are applicable for family history purposes. Y-chromosome DNA tests explore the direct paternal line and are generally part of a surname study. Mitochondrial DNA tests can be used for analysis of the direct maternal line. Autosomal DNA tests can be used to find genetic matches with close relatives, and sometimes more distant cousins, on all the different lines, through both males and females - but for just a few generations. Normally, you would have already identified these relationships through records research. So you know most of this part of your genealogy already. From a practical point of view, that is the biggest problem with today's genetic genealogy tests. In many cases, they can't tell you very much that you don't already know. DNA test kits can be ordered through the mail or via the Internet at ftdna.com at a cost averaging $100-$400 per test. They usually consist of a cheek swab to collect a sample of cells from the inside of your mouth. You send back the sample through the mail and within a month or two you receive the results - a series of numbers that represent key "markers" within your DNA. These numbers can then be compared to results from other individuals to help you determine something about your ancestry. A single DNA test on its own provides only a limited amount of information, most of the value of a test lies in the comparison process. Humans share about 99.9 percent of the same sequence of DNA. Only about 0.1 percent of the sequence is different among various groups of humans. Regional populations of humans tend to share many of the same genetic markers. By comparing your DNA to a database with other people's DNA sequences, genetic tests can give you an idea of where your ancestors on that particular line came from. The information you get from a DNA genealogy test is general and probabilistic. That means the answers are based on statistical probabilities - they aren't hard and fast facts. While some genetic markers may be commonly found in one particular population, that doesn't mean they're unique to that people. It just means you're statistically more likely to be related, on that line, to those people than to other groups. But these distant ancestor's own ancestors ultimately came from other places. So, most of your genetic ancestry will still only be known in very general terms involving the long-term migrations of populations of ancient people. Y-chromosome DNA (Y-DNA) haplogroups are the major branches on the human paternal family tree. Each haplogroup has many subbranches called subclades. 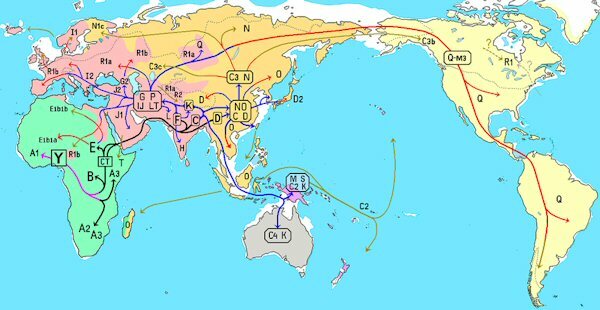 Haplogroups and their subclades mark human migrations. Thus, learning about your haplogroup can tell you something about your male line ancestors' migrations. All of the major haplogroups evolved out of Africa starting about 170,000 years ago and spread throughout the world from there. To illustrate the branching of these haplogroups and subclades and how they relate to human migration, I will use my own Y-DNA test results that place me in what is now labeled I1-M253. Your own Y-DNA test may place you in a totally different haplogroup following a very different branching and migration path. Haplogroup I is a branch of the mega-haplogroup F. The I1 branch originated about 5000 years ago among the people of Southern Europe. As the last ice age ended, it spread into Northern Europe. The mutation that gives rise to subclade I1-M253 appeared about 3,500 years ago. While many members of this subclade trace their ancestry to Scandinavia, others find their roots in the British Isles, Germany, Central Europe, Russia and beyond. People belonging to this haplogroup all descend from a single man who lived less than 3,500 years ago. This most recent common ancestor lived somewhere in the far northern part of Europe, perhaps Denmark. His descendants are primarily found among the Germanic populations of northern Europe and the bordering populations, although even in traditionally German demographics I1-M253 is overshadowed by the more prevalent haplogroup R1a and R1b. Haplogroup I1-M253 represents over 35% of the population in Scandinavia and northern Germany. It is often associated with the Norse ethnicity and is found in all places invaded by the ancient Germanic tribes and the Vikings. In Britain, haplogroup I1-M253 is often referred to as a marker for "invaders," Viking or others. The most common Y-DNA test for genealogical purposes looks at the values of 67 "markers" - specific locations on the Y chromosomes where numbers of repetitions of a series of chemical characteristic are counted. These numbers or "alleles values" define your haplotype. The values at these marker locations mutate very slowly over generations. Matching the values of these markers with those of many other people in a large database is the basis for determining what haplogroup and what subclades you belong to. Since some people in a large database of tested people have been able to identify distant ancestors through a "paper trail" of records and know where they lived centuries ago, a close identification of your own markers with theirs indicates a high probability of a common ancestry on your direct male line. These relationship matches are usually represented by a series of probabilities for a common ancestor within a certain number of generations. For instance, in the case of my own DNA, it indicates that there is a greater than 97% probability of a common male ancestor within 12 generations and a greater than 99% probability within 16 generations of some Farris and related families with some members of Fairbairn, Elliott, and Irwin families whose ancestry traces to the Borders area of Scotland - families who are documented in that area far back into the days of the "Border Reivers" when the Scotland/England border was a very wild and lawless place. And these early clans were probably descendants of the Vikings even further back. A mitochondrial DNA test is the logical equivalent of a Y-DNA test but following Mitochondrial DNA . That is, it traces DNA characteristics passed from mother to daughter back through many direct female ancestors. While the Y-DNA tests parallel the traditional surname convention and follows generations of males who mostly have the same surname, the mitochondrial DNA follows the direct female lines that traditionally change surnames nearly every generation. Thus, it is much harder to establish a paper trail of known identification back very many generations along such a line. But, again, each of these types of tests follows only one line of your ancestry and provide no information regarding the many other lines that constitute your complete genealogy. Autosomal DNA tests utilize DNA from the 22 pairs of autosomal chromosomes inherited from both parents. So an autosomal DNA test may be taken by either a male or a female. This test is designed to trace all of your ancestral lines for about 4-5 generations using your autosomal DNA. It tests thousands of data points on your 22 autosomal chromosomes. Your results are then compared to others in the database of those who have taken the same test. The test detects linked blocks or segments of DNA that indicate a common ancestor. The number and size of these segments is used to determine how recently any two people are related. While it may be used with equal success by both men and women to find connections on any of your family lines, the challenge is determining which branch of your family tree you share with your cousin. That normally requires record research - which you probably should have done anyway. In the very abbreviated summary of my Y-DNA results above I touched on several topics that may raise questions that need to be addressed in a historical context. There is a mythology that has evolved over a long time regarding "Vikings" that tends to mischaracterize who they were and what they did. The word "viking" started out as a verb in Scandinavia. To go viking originally meant simply to travel and explore. The ancient people that populated what is now Scandinavia after the last ice age migrated there from southern Europe via several different routes and were comprised of at least two distinct haplogroups. The "Norsemen" in the northern regions were generally distinct from those in what is now Denmark and nearby Germanic regions. But both of these populations were exploring seafarers who went viking in many different directions. The purposes of various voyages were different. Some resulted in long-term settlements, some in shorter term stays, some in commercial trading endeavors. By the people in already populated areas such as the eastern coast of England and Scotland, these incursions were often characterized as invasions or raids - and the perpetrators as "Vikings." Whether they were invaders or settlers depends on your point of view - but they interbred with local populations and left their genetic signature in many places. And that may be part of your heritage as it apparently is mine. Surnames are a relatively new phenomenon in genealogical terms. They came into use gradually as a mechanism for differentiating individuals in groups with several people with the same forename - and were often derived on the basis of family relationships, specific crafts, or specific localities. Initially surnames were not fixed and were changed as circumstances warranted - such as a new location or a different profession or craft. During periods when clans developed based on a family name, people who joined the clan often adopted the clan surname as their own. Migration to an area with a different language or dialect could result in modification of the surname - as happened with numerous immigrant families to the United States. Also, the same surname could develop in different areas derived from a different basis - as happened with the name Farris which is an old and common name in some parts of the middle East such as Lebanon, but also in different parts of Europe adopted from variations of other names such as Fergus or as a profession based on horsemanship. So it shows up as a common name in distinctly different DNA haplogroups. Before the kingdoms of Scotland and England were united under the reign of King James I, there were frequent wars and battles and incursions into disputed territory by one side or the other over a period of several centuries. While there were hostilities along the entire border, the several shires along the eastern border seemed to have been a hot spot. This area was populated by numerous clans who sometimes were allied and sometimes not - and these groups conducted frequent raids across the border in both directions. Particularly on the Scotland side, these clans or families appear to have been partially descendants of Vikings who invaded or settled in that area along the coast from southern Scandinavia several centuries before. Collectively, over a long period, these clans became known as "Border Reivers" - based on their propensity to conduct frequent raids across the border to acquire livestock and other possessions. If you are interested in this topic see the summary in Wikipedia under the label "Border Reivers." When this long period of lawlessness was finally brought to an end and the kingdoms united, some of the members of the more notorious border clans were forcibly resettled elsewhere, including northern Ireland. But some families remained in the borders area and still have descendants there today. My Y-DNA indicates that my direct male lineage is apparently from families in that area. There are numerous individuals with differing surnames in the DNA database who appear likely to be descendants of one common male ancestor from that area within 12 -16 generations, i.e., within the last 500 years. The old Scottish borders area included the shires of Roxburgh, Berwick, Selkirk, and Peebles. I'll end this column as I began it - with the caution that DNA testing can only augment traditional records research in explaining your ancestry - and only on a very limited number of your ancestral lines. So use it appropriately to add some insight - but don't try to use it as the only mechanism for determining your family history. In my own case, where there are unknowns on my male line ancestry, I found it helpful in confirming what I had already concluded in my own research. As I've pointed out in previous columns, when researching Farris records in Kentucky and back into Virginia in the 1700s, it seemed to me that there were many, many Farris records - but very few that involved my own ancestors. It seemed likely to me that my Farris line was not closely related to the other Farris families that were common throughout Kentucky and back into Virginia in the 1700s and early 1800s. My Y-DNA test results seem to confirm that - since the only close matches to people with the surname Farris (with various spellings) that I have are to people in the database who I already knew were a part of my own line. The surname arose in several different places and was derived from different sources. This illustrates a point that I've often made in communicating with others doing family history research. That is, don't focus too much on your own surname. That one family name is only one of many that make up your heritage and, at any rate, surnames have not been fixed in stone for that long in genealogical terms.